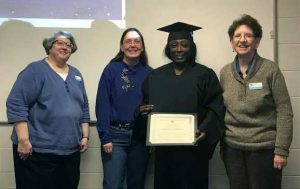 A recent graduate from the Dominican Learning Center’s GED program celebrates with her tutors, from left, Sr. Mary Angela Dean, Cathy Lamb, graduate Freweyni, and Sr. Shawn Fitzgerald. Columbus, OH – The Dominican Learning Center has been awarded a nearly-$10,000 grant from the Dollar General Literacy Foundation to help more than 40 underserved adult learners earn their GED, or High School Equivalency degree. This local grant is part of more than 159 million in grants awarded by the Dollar General Literacy Foundation since it was founded in 1993. “A high school diploma or GED raises median weekly earnings by almost $200,” says Lisset Mendoza, Director of the Dominican Learning Center. “This increase in wages makes a real difference in the life of a family – and in the financial health of the Central Ohio community. The Dominican Learning Center is the only facility in Central Ohio that offers a Spanish-language GED program. Now in its second cycle, this program has an 80% graduation rate, and all of those new graduates have received promotions or pay raises at their jobs. As important is the boost in confidence and self-esteem that this educational opportunity has helped to provide. Currently, the Dominican Learning Center has more than 400 adult learners enrolled, from 49 countries around the world. One of the goals of the DLC is to promote peace and non-violence among immigrant communities in Central Ohio.